If you are a person with an artistic mind and you have got some kind of interest in the field of designing then definitely you will be involved with some kind of designing of your clothes. The quite famous phenomenon nowadays is called as embroidery digitizing that is available for producing the quality work of embroidery with the help of computerized technology. But the one main factor that is seen and is of concern is the factor of money because each and every person cannot afford the things in high prices no matter how good or attractive they are. 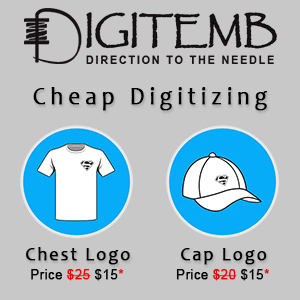 So, first thing that many people observe or find in the digitized embroidery is cheap digitizing. One way is to go to each and every shop or company shop by yourself and then comparing all the prices. But today with the facility of internet you can do comparison by sitting at your home. On internet many companies are providing details of their work with price and other necessary items. The criteria of price are defined on each and every website almost. Some companies charge according to the number of stitches like one dollar for thousand stitches or four dollars for thousand stitches. Now the lowest price seem on the websites of many websites is almost one dollars for thousand stitches. 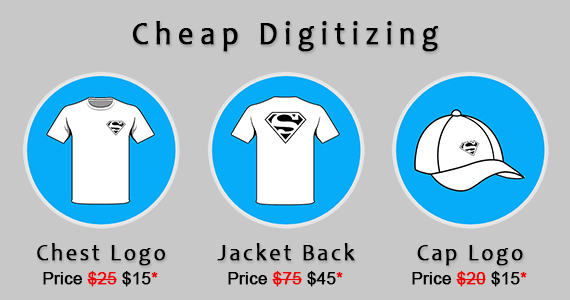 So if a company is taking one dollar then definitely it will be a cheap digitizing price. The price of the embroidery is also charged on the basis of the size of the design. In the price of the design that are charged form size, color and other factors count so much on them. Many companies are also offering the flat rates for the designing of the logo. Some sample rates of different websites include fifteen dollar for the logo digitizing on the chest and Cap, One thing must be kept in mind that people who are using looking for cheap rates and prices must be more conscious about the quality of the embroidery and designs. It is seen that many websites and companies that are offering cheap digitizing, often compromise on quality in order to attract more customers on the basis of less prices. And in any kind of product or matter quality must be given the first priority and after that the talk of prices and other forms of things are considered. If you are getting less prices and quality is not present in that product then it is of no use. And if you are looking for cheap digitizing with good quality so why not try us? Just click on the signup button on the top right corner of the website and register with us right now.